Vatican City (/ˈvætɪkən/ ( listen)), officially Vatican City State (Italian: Stato della Città del Vaticano;[d] Latin: Status Civitatis Vaticanae),[e][f] is an independent city-state enclaved within Rome, Italy. Established with the Lateran Treaty (1929), it is distinct from yet under "full ownership, exclusive dominion, and sovereign authority and jurisdiction" of the Holy See (Latin: Sancta Sedes). 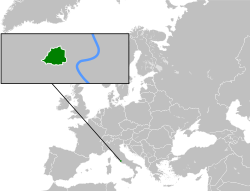 [g] With an area of 44 hectares (110 acres), and a population of about 1,000, it is the smallest state in the world by both area and population. For most of this time the popes did not live at the Vatican. The Lateran Palace, on the opposite side of Rome, was their habitual residence for about a thousand years. From 1309 to 1377, they lived at Avignon in France. On their return to Rome they chose to live at the Vatican. They moved to the Quirinal Palace in 1583, after work on it was completed under Pope Paul V (1605–1621), but on the capture of Rome in 1870 retired to the Vatican, and what had been their residence became that of the King of Italy. After the American entry into the war, the US opposed such a bombing, fearful of offending Catholic members of its military forces, but said that "they could not stop the British from bombing Rome if the British so decided". The British uncompromisingly said "they would bomb Rome whenever the needs of the war demanded". 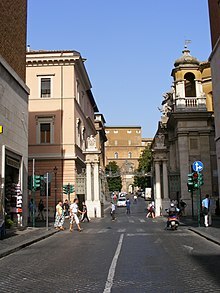 In December 1942, the British envoy suggested to the Holy See that Rome be declared an "open city", a suggestion that the Holy See took more seriously than was probably meant by the British, who did not want Rome to be an open city, but Mussolini rejected the suggestion when the Holy See put it to him. In connection with the Allied invasion of Sicily, 500 American aircraft bombed Rome on 19 July 1943, aiming particularly at the railway hub. Some 1,500 people were killed; Pius XII himself, who had been described in the previous month as "worried sick" about the possible bombing, viewed the aftermath. Another raid took place on 13 August 1943, after Mussolini had been ousted from power. On the following day, the new government declared Rome an open city, after consulting the Holy See on the wording of the declaration, but the British had decided that they would never recognize Rome as an open city. 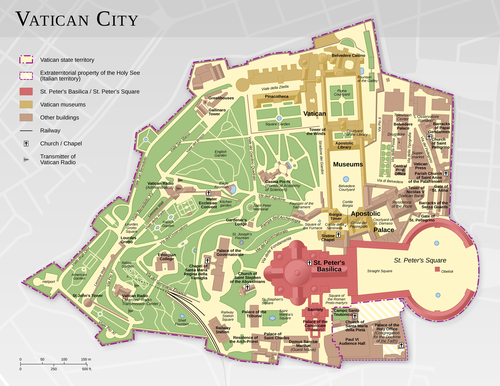 Map of Vatican City, highlighting notable buildings and the Vatican gardens. 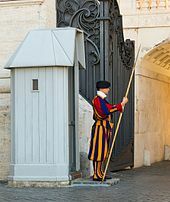 A guard of the Vatican at his sentry box. Pontifical Swiss Guard in his traditional uniform. 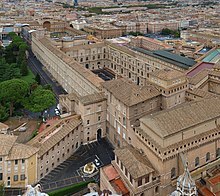 Palace of the Governorate of Vatican City State. The Ingresso di Sant'Anna, an entrance to Vatican City from Italy. Almost all of Vatican City's more than 450 citizens either live inside the Vatican's walls or serve in the Holy See's diplomatic service in embassies (called "nunciature"; a papal ambassador is a "nuncio") around the world. The Vatican citizenry consists almost entirely of two groups: clergy, most of whom work in the service of the Holy See, and a very few as officials of the state; and the Swiss Guard. Most of the 2,400 lay workers who comprise the majority of the Vatican workforce reside outside the Vatican and are citizens of Italy, while a few are citizens of other nations. As a result, all of the city's citizens and places of worship are Catholic. In statistics comparing countries in various per capita or per area metrics, the Vatican City is often an outlier — these can stems from the state's small size and ecclesiastical function. For example, as most of the roles which would confer citizenship are reserved for men, the gender ratio of the citizenship has many men per woman Further oddities are petty crimes against tourists resulting in a very high per-capita crime rate, and the city-state leading the world in per-capita wine consumption. A jocular illustration of these anomalies is sometimes made by calculating a "Popes per km2" statistic, which is greater than one because the country is smaller than a square kilometre in area. The Vatican Museums (Musei Vaticani) display works from the extensive collection of the Catholic Church. The shortest national railway system in the world. 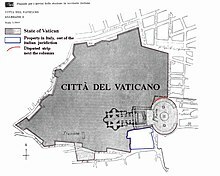 Vatican City has a reasonably well-developed transport network considering its size (consisting mostly of a piazza and walkways). A state that is 1.05 kilometres (0.65 miles) long and 0.85 kilometres (0.53 miles) wide, it has a small transportation system with no airports or highways. The only aviation facility in Vatican City is the Vatican City Heliport. Vatican City is one of the few independent countries without an airport, and is served by the airports that serve the city of Rome, Leonardo da Vinci-Fiumicino Airport and to a lesser extent Ciampino Airport. 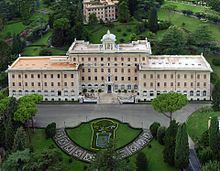 The Vatican's post office was established on 11 February 1929. ^ Stato della Città del Vaticano (Italian pronunciation: [ˈstaːto della tʃitˈta ddel vatiˈkaːno]) is the name used in the text of the state's Fundamental Law and in the state's official website. ^ The Ecclesiastical, and therefore official, pronunciation is [ˈstatus tʃiviˈtatis vatiˈkane], the Classical one is [ˈstatʊs kiːwɪˈtaːtɪs waːtɪˈkaːnae̯]. ^ Solemn oath of the Vatican Swiss guards. 6 May 2014 – via YouTube. ^ a b Mrowińska, Alina. "Behind The Walls: What It's Like To Live Inside The Vatican, For A Woman" Archived 1 January 2016 at the Wayback Machine, Gazeta Wyborcza/Worldcrunch, 26 February 2013. ^ a b "Vatican City drinks more wine per person than anywhere else in the world". The Independent. 2014-02-25. Retrieved 27 July 2018. ^ "Vatican crime rate 'soars'". 2003-01-08. Retrieved 2019-03-06. ^ Miller, Anne; Mitchinson, John (2013-03-14). "QI: some quite interesting facts about Popes". ISSN 0307-1235. Retrieved 2019-03-06. ^ On call 24/7: Vatican phone system directs thousands of call each day Archived 19 December 2012 at the Wayback Machine, 24 July 2006. ^ "Vatican surpasses all nations... in pickpockets?" Archived 15 November 2012 at the Wayback Machine. Rome Reports, 14 February 2011. 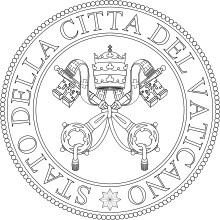 The politics of Vatican City take place in a framework of a theocratic absolute elective monarchy, in which the Pope, religiously speaking, the leader of the Roman Catholic Church and Bishop of Rome, exercises ex officio supreme legislative, executive, and judicial power over the Vatican City, a rare case of non-hereditary monarchy. The Vatican City State is a neutral nation, which has not engaged in any war since its formation in 1929 by the Lateran Treaty. It has no formal military compact or agreement with neighbouring Italy, although responsibility for defending the Vatican City from an international aggressor is likely to lie primarily with the Italian Armed Forces. 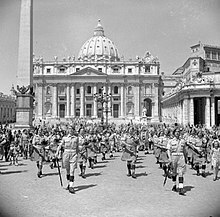 Although the Vatican City State has never been at war, its forces were exposed to military aggression when it was bombed during World War II, and whilst defending Vatican property in Rome during the same conflict. The Cathedral of the Most Holy Savior and of Saints John the Baptist and the Evangelist in the Lateran, – also known as the Papal Archbasilica of St. John [in] Lateran, St. John Lateran, or the Lateran Basilica – is the cathedral church of the Diocese of Rome in the city of Rome and serves as the seat of the Roman Pontiff. A prisoner in the Vatican or prisoner of the Vatican is how Pope Pius IX was described following the capture of Rome by the armed forces of the Kingdom of Italy on 20 September 1870. Part of the process of Italian unification, the city's capture ended the millennial temporal rule of the popes over central Italy and allowed Rome to be designated the capital of the new nation. The appellation is also applied to Pius's successors through Pope Pius XI. The Lateran Palace, formally the Apostolic Palace of the Lateran, is an ancient palace of the Roman Empire and later the main papal residence in southeast Rome. Francesco Marchisano was an Italian Cardinal who worked in the Roman Curia from 1956 until his death. Born in Racconigi, he was ordained a priest in Turin by Cardinal Maurilio Fossati in 1952. The black nobility or black aristocracy are Roman aristocratic families who sided with the Papacy under Pope Pius IX after the Savoy family-led army of the Kingdom of Italy entered Rome on 20 September 1870, overthrew the Pope and the Papal States, and took over the Quirinal Palace, and any nobles subsequently ennobled by the Pope prior to the 1929 Lateran Treaty. The Vatican Railway was opened in 1934 to serve Vatican City and its only station, Vatican City. The main rail tracks are standard gauge and 300 metres (0.19 mi) long, with two freight sidings, making it the shortest national railway system in the world. Access to the Italian rail network is over a viaduct to Roma San Pietro railway station, and is guaranteed by the Lateran Treaty dating from 1929. The tracks and station were constructed during the reign of Pope Pius XI, shortly after the treaty. Francesco Borgongini Duca was an Italian Cardinal of the Catholic Church who served as Apostolic Nuncio to Italy from 1929 to 1953, and was elevated to the cardinalate in 1953 by Pope Pius XII. Crime in the Vatican City consists largely of purse snatching, pick-pocketing and shoplifting by tourists. The tourist foot-traffic in St. Peter's Square is one of the main locations for pickpockets in Vatican City. The Church of Saint Anne in the Vatican, known as Sant'Anna de' Parafrenieri, is a Roman Catholic parish church dedicated to Saint Anne in Vatican City. The church is the parish church of the State of Vatican City and is placed under the jurisdiction of the Vicariate of the Vatican City and is located beside the Porta Sant'Anna, an international border crossing between Vatican City State and Italy.